The menorah has tremendous significance in Jewish culture due to its longstanding association with the history of Judaism. Their distinctive structure and signature flickering glow have made them iconic for centuries, and perhaps no other symbol is so immediately emblematic of the Jewish faith. At Zion Judaica, we take great pride in the history and importance of the menorah, and this is why we searched the globe for the finest and most unique menorahs available from any retailer. Zion Judaica is home to a vast selection of stunning sterling silver menorahs in eye-catching contemporary styles as well as traditional styles that have been illuminating the Jewish community for thousands of years. Our finely crafted sterling silver menorahs are built as family heirlooms, featuring sturdy construction and quality materials meant to last generations. 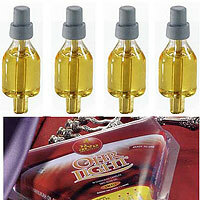 We have both candle and oil burning menorahs, and even some models designed to use either. 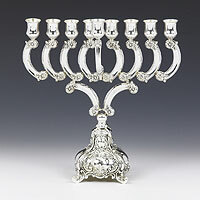 Experience the uncanny gleam of a high grade sterling silver menorah from Zion Judaica. Zion Judaica offers a line of decorative sterling silver menorahs created by skilled artisans and respected designers to show your eye for style. 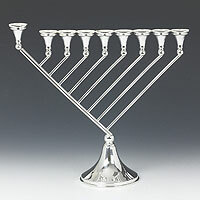 We are the manufacturer or sole domestic provider of many of our menorah styles. Choose from a variety of exclusive menorah styles unavailable from any other source. We also offer an engraving service to allow you to personalize your menorah with a family name or custom text in English or Hebrew. Our customer service agents are ready to assist you with your purchase of a standard or custom menorah. 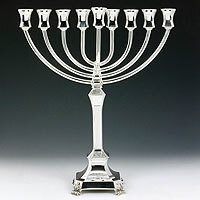 Shop Zion Judaica for the best and brightest in silver menorah.